The purpose of the proposed Underground Flow Equalization System Project is to help eliminate sewer overflows to San Mateo streets, creeks, the lagoon, and San Francisco Bay. These sewer overflows occur primarily during heavy rains, when additional water gets into the sewer system and overwhelms its capacity to collect and transport the combined excess water and wastewater to the wastewater treatment plant. Additionally, during peak rains, the wastewater treatment plant cannot treat the volume of combined excess water and wastewater it receives as quickly as it is entering the system. In 2009, the San Francisco Bay Regional Water Quality Control Board (RWQCB) issued a Cease & Desist Order that requires the City to eliminate sewer overflows and provide capacity assurance. The permit that allows the City to discharge treated water to the San Francisco Bay (Environmental Protection Agency [EPA] 2013 National Pollutant Discharge Elimination System permit) also requires the City to eliminate blending and use an integrated approach to collect and treat the combined excess water and wastewater. The proposed project will help San Mateo comply with the RWQCB’s and EPA’s regulations. The project will increase the holding capacity of the overall wastewater collection system, allowing excess water and wastewater to be adequately treated at the downstream wastewater treatment plant. It consists of an underground, concrete holding structure; pump station; odor control equipment room; and diversion pipelines. Most of the system will be underground; however, some minor fixtures, including access hatches, an electrical building, and vents for treated air, will be at or above the ground surface. These facilities are becoming more widely used across the entire country as a means of providing additional capacity in sewer systems during heavy rains to help prevent sewer overflows. Daly City has been operating a similar system as part of its award-winning wastewater treatment system since 1989; and the city of Pacifica constructing a similar system, which is expected to be completed by May 2019. To meet the sewer overflow reduction goals, the underground structure must allow for temporary holding of up to approximately 5.3 million gallons. The pipelines conveying flows to the facility will have a total capacity of approximately 25 million gallons per day. During heavy rains, when sewer system overflows are common, these new diversion pipelines will temporarily route high flows from the existing sewer pipelines to the underground holding structure, where it can be stored for up to 24 hours. Once the downstream collection system has available capacity, a pump station inside the holding structure will release the excess wastewater back into the collection system via a pressure pipeline, or force main. An emergency diesel generator will allow diversion and holding processes to continue during power outages. The facility will also provide temporary wastewater diversion and holding to facilitate future sewer construction projects, as well as operations and maintenance activities, such as pipeline inspection and cleaning. After any use, self-cleaning mechanisms will flush and clean the facility, while odor control systems will operate to prevent odors from affecting the surrounding community. Approximate dimensions for the underground temporary holding structure are 200 feet by 150 feet. These dimensions may change as the design progresses. 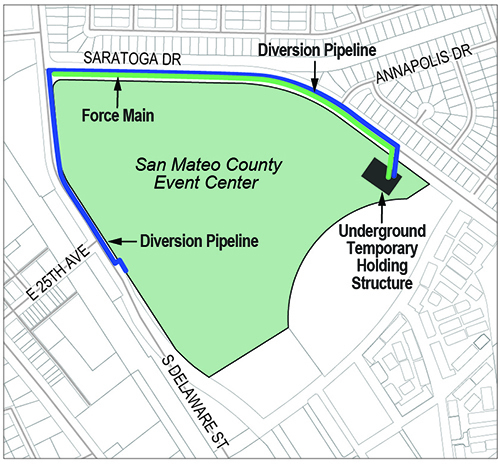 The location of the proposed project is the San Mateo County Event Center property between Saratoga Drive and South Delaware Street. The proposed temporary holding structure portion would be located in the east corner of the Event Center parking lot, adjacent to Saratoga Drive (Assessor’s Parcel Number 040 030 220). The northernmost point of the site is located at approximately latitude 37°32’51.13″N, longitude 122°17’53.78″W. Diversion pipelines will be installed under South Delaware Street and Saratoga Drive. The City, as lead agency under the California Environmental Quality Act, is proceeding with an Environmental Impact Report (EIR) for the project, which will tier from the previously certified 2016 Final Programmatic EIR and provide a project-level review of environmental impacts. The Notice of Preparation can be found here. The Draft EIR is now available here. Hard copies will also be available at City Hall, the San Mateo Main Library, and the Hillsdale Branch of the San Mateo Public Library. You are invited to learn more about the environmental impacts covered in the Draft EIR and provide verbal comments at the April 9, 2019 Planning Commission meeting, which will be held at 7:00 at City Council Chambers. The project is currently under review by City Planning for a Special Use Permit, which will also be discussed at the April 9 meeting. Comments on the Draft EIR will be accepted between March 6, 2019 and May 7, 2019, and can be sent to: City of San Mateo Public Works Engineering, 330 W. 20th Avenue, San Mateo, CA 94403, Attention: Clean Water Program, or emailed to info@CleanWaterProgramSanMateo.org. A Final EIR, incorporating written responses to comments received during the public comment period, will be released in late summer 2019. The Final EIR will be presented to the Planning Commission and City Council for consideration of adoption.